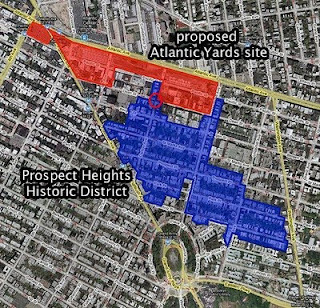 One enduring question in the Atlantic Yards saga concerns the appropriate site for an urban sports facility. The consensus has grown that suburban-style stadiums and arenas, surrounding by a sea of parking, is a bad idea. Then again, urban sports facilities are often located near or in downtown but not necessarily bordering housing or established low- or mid-rise neighborhoods, but rather office, warehouse, or retail/entertainment districts. Experience has also shown that arenas and other sports facilities thrive in combination with a strong mix of commercial and residential land uses, both as proposed elements of a larger master plan or as a catalyst for urban development. But the examples provided aren't really on point. San Diego’s PETCO Park is part of a much larger Ballpark District. The Verizon Center in Washington DC borders mostly retail and entertainment uses. 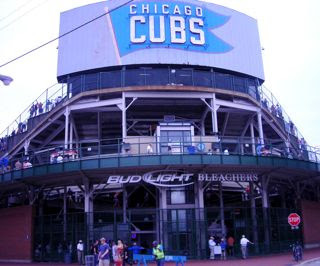 The most interesting, and complicating, example is Chicago's Wrigley Field, home of the baseball Cubs. 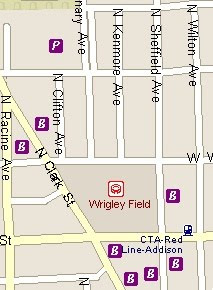 The ESDC says Wrigley fits into its neighborhood. 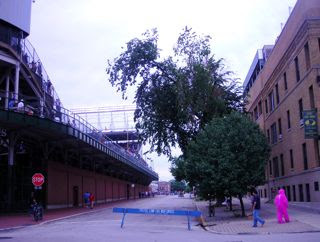 However, there are some significant contrasts between Wrigley and the proposed Atlantic Yards arena, as I learned when I visited Chicago's Wrigley Field in July during an afternoon baseball game and took photos and a video (below). 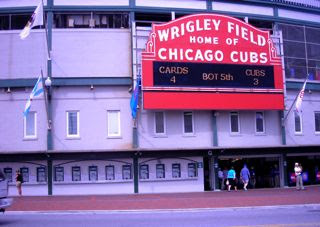 Another example of the compatibility of a sports facility with a residential neighborhood is Wrigley Field in Chicago, a 40,000-seat (outdoor) baseball stadium that is home to the Chicago Cubs. 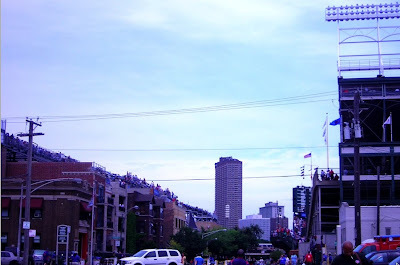 While most stadiums are located in economically deprived, former urban renewal areas, enterprise zones, or industrial areas away from residential neighborhoods where land is often cheaper, Wrigley Field sits in the middle of the Lakeview residential neighborhood. 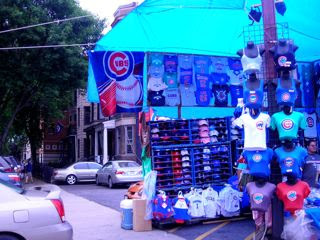 Wrigley Field has become a vital part of the neighborhood. As the photos suggest, there's one immediate difference: the residential buildings on two sides of the stadium sell/rent at a premium because they're adjacent and offer rooftop views of the baseball games. No such views, of course, would be available of indoor basketball games in Brooklyn during cold weather, despite glass windows. 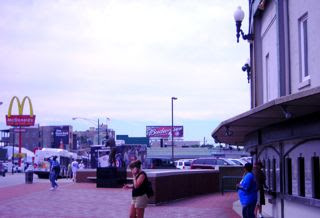 There is housing across the street along with numerous restaurant and bars, commercial uses which at least to some extent benefit from their close proximity to the ballpark. 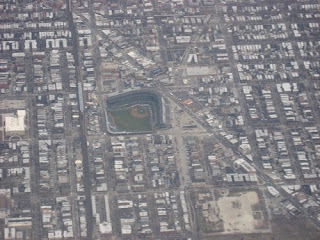 This example shows that well-placed baseball stadium or basketball arenas in or immediately adjacent to a downtown area or a large residential area can have a major (beneficial) impact upon its surroundings when compared to a similar facility in a remote location surrounded by a sea of parking. But that's not necessarily the comparison. 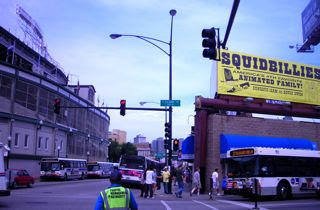 Keep in mind that that, on two sides of Wrigley Field are streets devoted to game-related retail, bars, and entertainment, as well as staging streets for a fleet of buses. (Streetcars once stopped next to the stadium entrance.) The Chicago El is nearby, as well. It would be far more difficult for such buses to be staged in Brooklyn, given the existing--and surely exacerbated--congestion on Atlantic and Flatbush avenues. 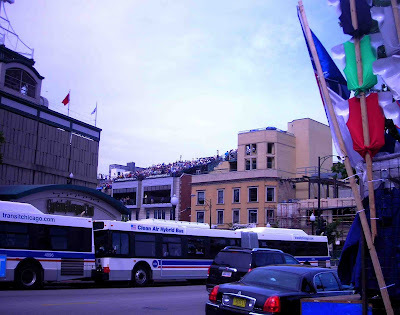 Wrigley, according to the affectionate and informative Wrigley Field: A Celebration of the Friendly Confines, was built in 1914, one year after Ebbets Field opened in Brooklyn and two years after (still-operating) Fenway Park opened in Boston. 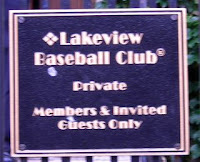 Some 40,000 people live within a half-mile in the neighborhood long known as Lake View, which began to be called Wrigleyville in the 1980s. 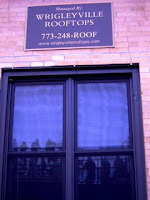 Only in the 1980s did the business of renting rooftop space to fans begin in earnest; a ticket, according to the 2003 book; tickets now go for $100-$185 a guest. 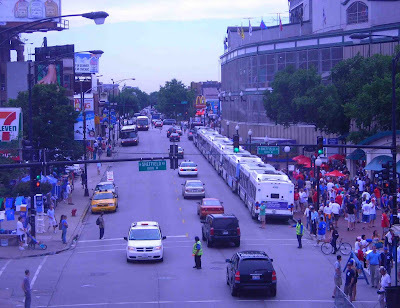 Also, the two streets bordering Wrigley and residential structures are closed during games for security. In New York, state officials and Forest City Ratner vow that no streets would be closed, despite doubts raised after the closure of streets adjacent to Newark's Prudential Center. 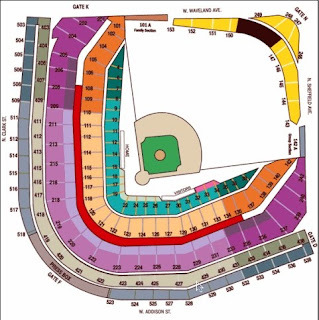 The project site is a unique location, and it is appropriate to locate an arena near a major transportation hub to facilitate mass transit to, and egress from, such a facility—similar to Madison Square Garden [MSG] in Manhattan. Patrons of the proposed arena are also expected to shop in the nearby commercial areas, and their presence would enliven the streetscapes along Atlantic and Flatbush Avenues. Therefore, the arena would be compatible with commercial and cultural (BAM) uses associated with Downtown Brooklyn to the north and west. Yes, but MSG is in essentially a business and retail district, with numerous nearby parking garages that have space in the evening. 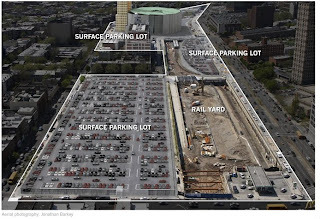 Because the lack of such parking garages near the Atlantic Yards site, and because state planners wouldn't bite the bullet and ban on-site parking, an enormous surface parking lot (with 1044 spaces) is planned for the southeast block of the arena site--crucially south and east of the arena, not north and west. That means thousands of people likely would be walking back and forth along the residential block of Dean Street (far left in photo, from Atlantic Lots) to the parking lot. The New York City Zoning Resolution prohibits arenas within 200 feet of mapped residential districts predicated on the assumption that the operation of such facilities is incompatible with districts limited primarily to residential use. Primary land use compatibility issues with respect to arena and adjacent residential districts include loading dock (operations), crowd and noise controls, and signage. Accordingly, the arena has been designed to avoid and minimize the operational effects on adjacent and on-site uses to the extent feasible. However, as noted below, Dean Street will be inundated with people traveling between the arena and the parking lot. According to Chapter 19, Mitigation, of the FEIS, about 600 of the 1100 parking spaces available on-site for use by fans at a Nets basketball game would have a three or more person requirement after 5 PM on game days. The remaining 500 spaces would be dedicated to suites and premium seating. There also would be a remote parking supply "equivalent to up to 20 percent of the expected demand for each basketball game at the arena (approximately 500 spaces)," at MetroTech. The FEIS estimates that no crosswalks would be significantly adversely impacted in 2010--after the initial putative ending date of Phase 1, the arena block. However, people walking to the parking lot would be noticed; "new demand would significantly adversely impact the north crosswalk on Carlton Avenue at Dean Street [circled in map] in the weekday 7-8 PM pre-game and Saturday 1-2 PM pre-game peak periods and the north crosswalk on 6th Avenue at Dean Street in the Saturday 1-2 PM pregame peak hour." The ESDC said that widening the crosswalks is expected to fully mitigate the impact. Well, it depends what's measured; I suspect the impact on the neighborhood, as seen in the Chicago example, would be much greater. In Chicago, there's very little parking around the Wrigley Field. 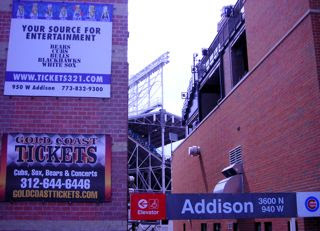 The Cubs explain that they offer one lot, but parking is not available for weekends, nights and holidays and parking around Wrigley Field is heavily restricted, with resident permits required. 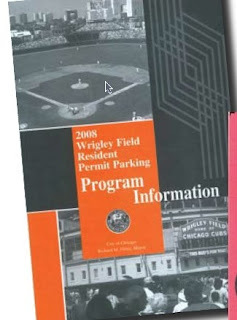 In 2004, in exchange for being able to play 30 rather than 18 night games, the City Council approved the Wrigley Field Neighborhood Protection Ordinance, in which the Cubs agreed to "fund and operate expanded remote parking, print residential parking permits, expand trash pick-up in and around Wrigley Field." 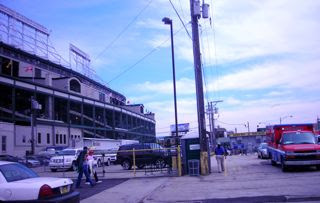 In its critique of the Atlantic Yards plan, BrooklynSpeaks cited the residential parking permit system instituted around Wrigley Field. There's no plan yet for residential parking permits around the AY site. 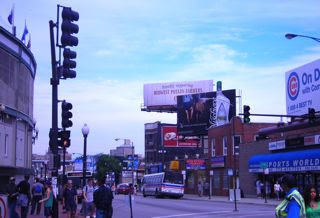 The Neighborhood Protection Plan 2008 Annual Report cites not only parking issues but also efforts by the Cubs to have public trash bins and additional cans emptied within an area of two square miles. 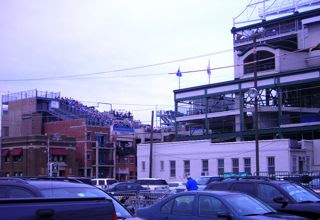 While the taverns, restaurants, rooftop spectators and resident Cub fans clearly receive some benefit from sharing their neighborhood with the Chicago Cubs, the relationship between the ballpark and the neighborhood residents and landlords has sometimes been contentious.... The residents’ concerns extend to crime, noise, congestion, traffic, and of course parking. The video below was a bit of experiment, so the picture quality is low and the hand-held camera can be shaky. 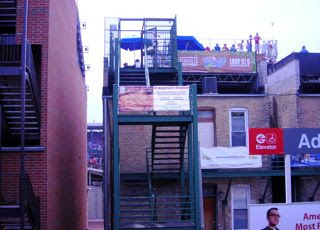 The route begins not at home plate but at Addison and Sheffield, going up the right-field line to center-field at Waveland and continuing counter-clockwise. 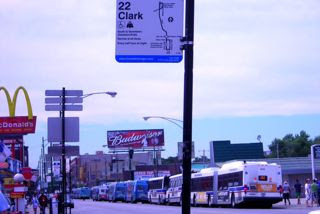 I then walked west on Waveland to North Clark, then down Clark to the main entrance at Addison, then east on Addison back to the Red Line stop on the El. Thanks for the fascinating info and photos! I've never been to Wrigley Field but, from what I've read, it appears that one other difference between Wrigley Field (and other older arenas / stadiums too) and the proposed Atlantic Yards Arena is that newer arenas like Atlantic Yards (and stadiums, like Yankee Stadium, etc.) are specifically designed to internalize a lot of the beneficial economic effects that older stadiums and arenas (like the Madison Square Garden previous to the current one) used to externalize. For instance, the old MSG had relatively very little in the way of indoor eating facilities. Spectators went to surrounding neighborhood bars, restaurants (like Jack Dempsey's), etc. instead. Actually, it seems that often a major reason older arenas / stadiums are dubbed "obsolete" is that they are too small to internalize and "capture" these beneficial (to the neighborhood) externalities. Although I haven't read it, I get the feeling that Chicago Cubs fan Philip Bess's 1989 book (which I thought you'd mentioned before), "City Baseball Magic," discusses these issues too. not much of a police presence in the pictures either ... were those pictures taken while the cubs were playing a home game? "See the Nets and NBA Stars in Newark"